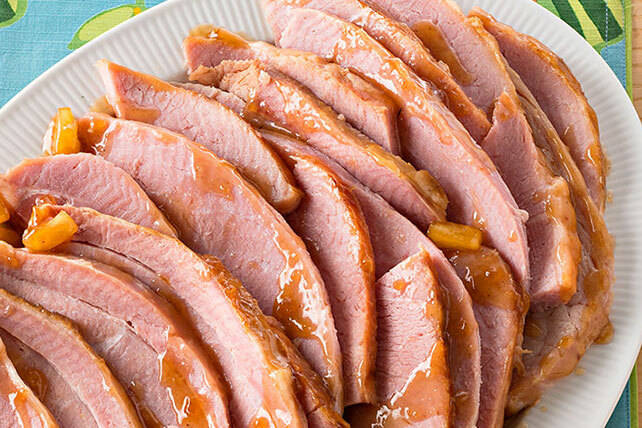 Impress the Easter crowd with an easy-to-make Slow-Cooker Easter Ham Recipe! Honey, BBQ sauce and more help our Easter ham recipe make such a tasty entrée. Mix barbecue sauce, sugar and honey in medium bowl until blended. Stir in pineapple; pour over ham. Cover with lid. Cook on LOW 4 hours or until ham is heated through, turning after 2 hours. Add 1/2 tsp. crushed red pepper to the barbecue sauce mixture before pouring over the ham. It is not recommended to cook the ham on the HIGH setting of the slow cooker since this dries out the ham. Since most hams are already fully cooked, warming them slowly on the LOW setting produces the best results.